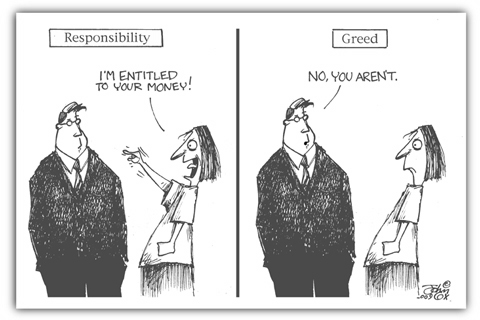 It's amazing what people believe they are "entitled to". Especially in the area of other people's property. You Beautiful John. You stuck the dismount. Love the expressions. That's how they are! Looks like the typical populist housewife who doesn't realize what's she's buying into. Reminds me of the kid (high school) who wrote the local newspaper after watching The Goracle's PowerPoint presentation. Kid was DEMANDING "free" health care for everyone. Mary Lou Retten, eat your heart out. Aw, Hell, who is John Galt? Take the suit off and put the guy in a pair of jeans and a polo shirt, somewhere out in the woods making the pipelines flow, and that guy'd be me. Absolutely perfect! Someone should put this on a billboard facing 1600 Pennsylvania Ave.
"I'm entitled to your money." - I think that's what my mom said that she heard from the purse snatcher after he grabbed her purse and knocked her to the ground. Today's Democrat Party: the party of purse snatchers, pickpockets, tax cheats, and other thugs, mooks, and skels. This page contains a single entry from the blog posted on March 10, 2009 6:31 PM.